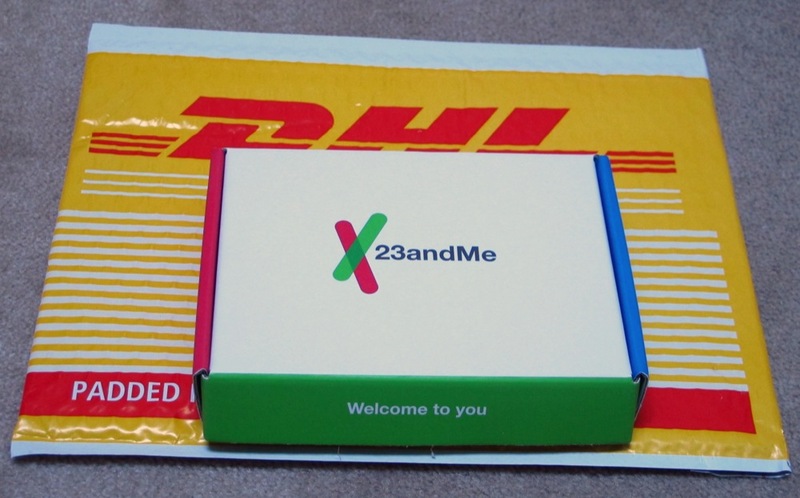 23andMe DNA Kit and Genetic Mapping Review | Save. Spend. Splurge. I got it for a deal for $99 on sale, and shipping cost $60 to Canada (return shipping included). Results will be posted online to my account, so no need to wait for any paper. I ordered it something like 3 days ago, and I received it REALLY quickly, which was surprising (to me anyway.. as I live in Canada and things habitually get lost in the mail here). These are special instructions for INTERNATIONAL deliveries. 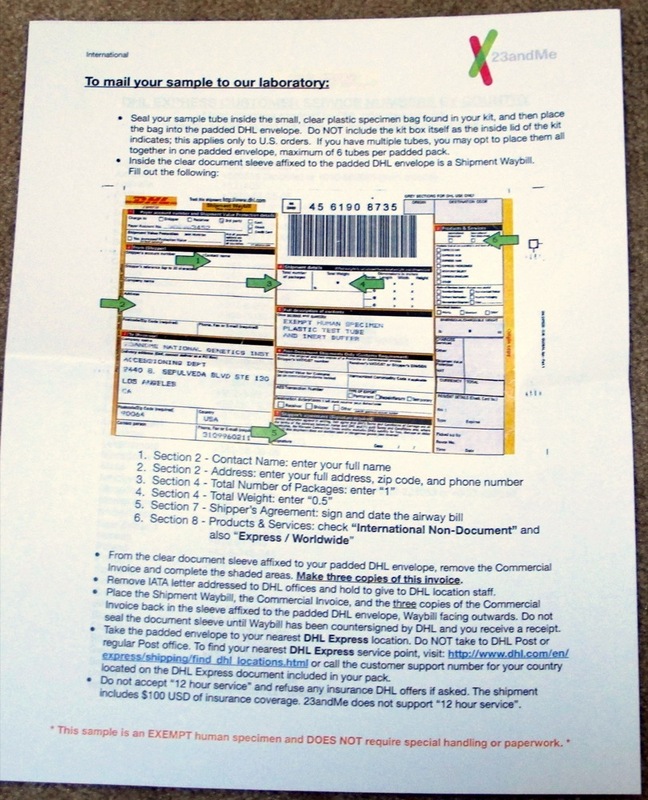 If you live in the U.S., you will probably get another set of instructions that include mailing the whole box back. After I mailed it off (the guy at DHL says he gets these things ALL the time, so he knew what to do), I waited about 3 weeks, and received my notifications online that they had completed the tests. I already know where my ancestors were from, so this was not a surprise to me, however it is still cool to see what percentage you’re made up of. Others who are more mixed, may find it interesting. I also found a lot of 3rd – 6th cousins, but none that are 2nd or 1st. This is disappointing, but I will wait and be patient. This is the part I was most concerned with, because I don’t really know my family beyond my grandparents, and even within my grandparents, I only knew one grandmother. Never met most of them, never talked to them, have no idea what the family history is like. It’s also nice that they list drugs that you may face problems with, and have to be careful taking if they are prescribed. I’ll be keeping this list on hand when I go to my doctor’s and if he tells me I need any medication on the list. That all sounds very scary, but when I looked at my entire list of what I could be diagnosed with, there was more good news than bad. Overall, I think it’s well worth it, especially for me. For $99, you can learn more about yourself that you didn’t know before. Sure it sounds like a lot of money, but I feel a lot better knowing the above information rather than not knowing it. Now I can watch out for Parkinson’s in my parents to make sure that they get treated if they need to be, and that makes me happier. ← Investing Series: How does the capital gains tax work in Canada? I first read about 23andMe on your website, recently I found out a friend around my age has terminal cancer … it’s hereditary in their family. 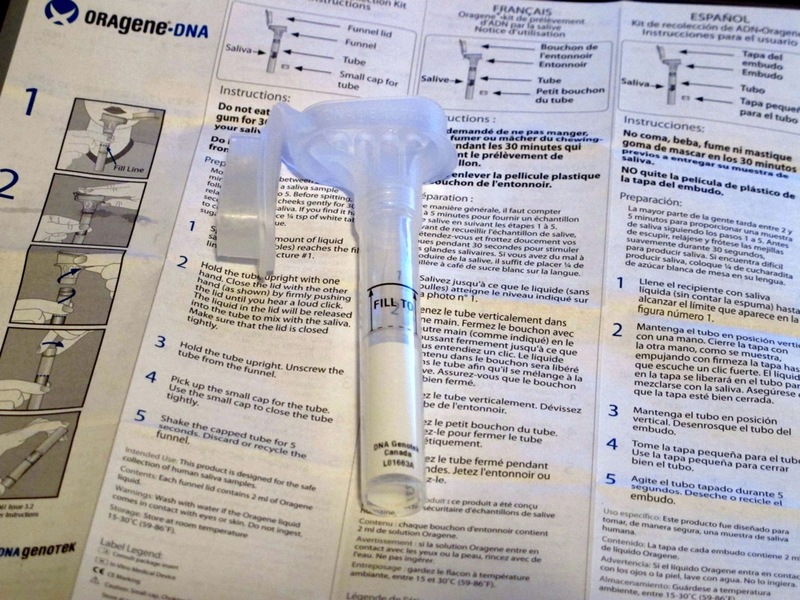 It has really made me want to get gene testing as well … did you know however, that 23andMe got a cease and desist letter from the FDA in November and now they have to stop providing their health services? I’m quite upset by this, as they are the only affordable test online, and now I can’t even get my own DNA tested. 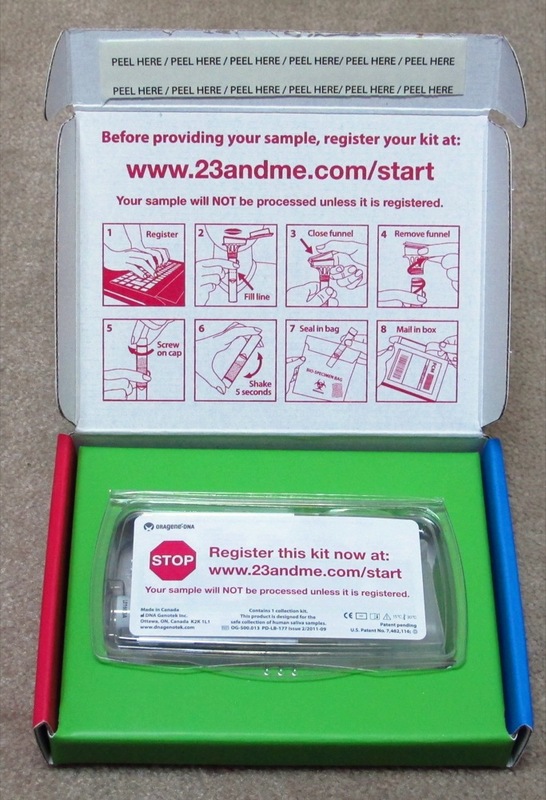 I’ve been DYING to get this kit, especially for the ancestry part and diseases. I think the $99 price tag is reasonable. Awesome company too. $99 is very reasonable and I am pleased I did it. It confirmed my fears (I do have diabetes in the family) and assuaged others. Very intrigued! Thanks for sharing. Like many of us, generations beyond my grandparents are from other countries (Okinawa, Germany and Denmark). I will also mention this to my sister who was adopted. She already has several chronic illnesses though so I don’t know if she can take finding about potentially more but maybe her lupus would’ve been diagnosed earlier if she had taken such a test when she was younger. But she may want to know about her ancestors. Yes! Or at least to perhaps know if her illnesses are masking another larger illness. The test that Angelina Jolie had to predict her risk of developing cancer cost $3,000. Money well spent if it keeps her alive to see her children grow. Mochimac, did you send in your Dad’s DNA too? I did this a few years ago and was only given my Mother’s side. I was told that I would need to have my Brother or Dad to do the test too. Are you thinking of doing it? I am not sure if I will pursue – I was a little taken aback when I found out that they don’t really have a lot of data on the indigenous American Indians in their database. Both sides of my family have American Indian origins. I am looking forward to seeing what it says. It’s actually very cool to see that information. I very much enjoyed the part about all my lack of genetic indicators for diseases and so on. Very interesting! I had heard about these kits, but I don’t know anyone personally who has used one before. I could see these kits being very useful to people who are adopted or orphaned, who have no way of knowing their family’s medical history. I have a lot of mystery around my family (they were very.. very.. poor and died early), so I don’t have any medical records beyond my parents.. which is what spurred me to do the test. Cool! Where can I do one of these too? Do they tell you who and where your cousins are? They have the profiles of others who are either set to anonymous or not. You can choose to reveal yourself or not as well. If your cousins are on there, they will link you via DNA, or you can link it yourself.